An RAF Squirrel Helicopter at RAF Shawbury. The station at Shawbury was first used for military flying training in 1917 by the Royal Flying Corps. No. 29 (Training) Wing formed on 1 September 1917 with three training squadrons, No. 10 Squadron, No. 29 (Australian) (Training) Squadron and No. 67 Squadron. Several different types of aircraft were operated which caused difficulties with training and maintenance. Two of the squadrons combined to form 9 Training Depot Station on 1 March 1918, the other moving to Gloucestershire. Training continued on a more organised basis until the end of the war. The airfield closed in May 1920 when strength of the RAF was drastically reduced. The hangars and other buildings were demolished and the land was returned to agricultural use. In February 1938 the station was reactivated as a training establishment, firstly used by No. 11 Service Flying Training School and an Aircraft Storage Unit (ASU) which was operated by No. 27 Maintenance Unit. The airfield also had Relief Landing Grounds at RAF Bridleway Gate and RAF Bratton, with additional satellite landing grounds at RAF Hinstock, RAF Hodnet and RAF Weston Park. Shawbury primarily prepared pilots for operational squadrons, with the main aircraft being the Airspeed Oxford. In 1944 it became the home of the Central Navigation School, which had moved from RAF Cranage in Cheshire, primarily concerned with improving the standard of air navigation in bombers. A Westland Wessex HC.2 of No. 2 Flying Training School which was based at RAF Shawbury between 1976 and 1997. In 1950, the School of Air Traffic Control moved to Shawbury, combining to form the Central Navigation and Control School. In 1963, the Navigation Wing moved to RAF Manby in Lincolnshire. No. 27 Maintenance Unit continued its aircraft storage and scrapping work at Shawbury until disbandment in July 1972. Shawbury became home to No. 2 Flying Training School in 1976, tasked with basic and advanced helicopter training and operating the Aerospatiale Gazelle and Westland Wessex in those roles respectively. In the 1980s Shawbury provided 'pre-employment training' courses for RAF groundcrew being posted from fixed-wing to rotary-wing squadrons. RAF Shawbury as seen from the cockpit of a Bell Griffin helicopter. No. 2 Flying Training School was disbanded in March 1997 so that in April 1997 the station could start providing training of helicopter pilots for all three of the UK's armed services, under the newly formed Defence Helicopter Flying School. Between 2001 and 2014 Shawbury was home to the Assault Glider Trust, a charity building a non-flying replica Horsa glider for museum display. The station's physical recreation training centre, named the Jubilee Hall Sports and Fitness Centre to mark the Diamond Jubilee of Elizabeth II, was opened by Prince Michael of Kent on 24 April 2012. In April 2016 the Central Air Traffic Control School (CATCS) was renamed the School of Air Operations Control (SAOC) and came under the control of the newly created Defence College of Airspace Control. In 2016, the Ministry of Defence selected Ascent Flight Training to deliver the UK Military Flying Training System, a 25-year contract to provide fixed-wing elementary, basic, multi-engine and fast-jet pilot training, rear crew training and helicopter training to the UK military. Subsequently, Ascent selected Airbus Helicopters to supply thirty-two helicopters to replace the DHFS Squirrel and Griffin aircraft. Airbus provided twenty-nine H135 airframes, known as Juno HT1 and three H145 airframes, known as Jupiter HT1. Due to the reduced requirement for search and rescue (SAR) training, following the privatisation of SAR provision, only three of the larger H145 aircraft are required, compared to the larger number of Griffins which were operated. The new fleet is entirely twin-engine, replacing the single engine Squirrel, as nearly all helicopters now operated by the UK military are twin-engined, apart from the Gazelle AH1, which is due for retirement. During 2016 and 2017, refurbishment of existing and construction of new buildings was undertaken as part of the contract. The work was undertaken by Kier Construction and included a new training school building, including space for flight simulators and refurbishment of hangars. The first two Juno and a Jupiter were delivered to Shawbury on 3 April 2017. Deliveries continue throughout 2017 and early 2018, with the final Juno arriving on 24 May 2018. With the new aircraft achieving full training capability, Squirrel and Griffin operations ceased on 1 April 2018 and the aircraft returned to civilian use. Other changes included the DHFS becoming a sub-unit of the Shawbury station headquarters, rather than an independent lodger unit, which it had been since in creation in 1997. Two wings were created, 2 Maritime Air Wing (2 MAW) and No. 9 Regiment. RAF Shawbury's mission statement is "To provide a safe, efficient, and effective airfield base environment; to enable and support, commanded, lodged and parented units; and to deliver wider Defence and RAF tasks as directed". The station is home to the Central Air Traffic Control School. An Airbus Juno HT1 of the Defence Helicopter Flying School. The Defence Helicopter Flying School (DHFS) provides basic helicopter pilot training for the RAF, Royal Navy and Army Air Corps (AAC), as well as foreign and commonwealth countries, using twenty-nine Airbus Juno HT1. The DHFS comprises two main elements, 2 Maritime Air Wing (2 MAW) and No. 9 Regiment. 2 MAW includes No. 660 Squadron of the AAC and 705 Naval Air Squadron and provide basic helicopter flying training. No. 9 Regiment comprises No. 60 Squadron of the RAF and No. 670 Squadron of the ACC in the advanced helicopter flying training. No. 202 Squadron is also part of the DHFS and operates the Airbus Jupiter HT1 at RAF Valley in Wales. Airbus provides and maintains the helicopters and Babcock and Lockheed Martin have contracts for infrastructure and ground Based Training Equipment. DHFS has 161 instructors, 102 of which are military and 59 which are civilian. The school is expected to train 286 students per annum. Four classes per annum year go through Shawbury on six-month courses, two with 705 NAS and two with No. 660 Squadron AAC. During the initial course students are taught basic rotary-wing skills and emergency handling, including engine-off landings, leading to a first solo flight and a handling check. Students then develop their basic skills into more applied techniques such as non-procedural instrument flying, basic night flying, low-level and formation flying, mountain flying in Snowdonia and an introduction to winching for FAA students. The RAF Central Flying School (Helicopter) Squadron provides Qualified Helicopter Instructor and Qualified Helicopter Crewman Instructor (QHI/QHCI) training for the Squirrel and Griffin. The unit trains crews from all three UK armed services as well as foreign air arms. Several RAF aircraft types are stored in long-term reserve at RAF Shawbury. These aircraft are stored in four specially de-humidified hangars at different states of readiness and can be brought back into active service if required. Other aircraft types which are no longer required for operational service are also stored pending their disposal. The unit is operated by FB Heliservices, part of Cobham. A RAF Shorts Tucano T1 in storage at RAF Shawbury. Flying and notable non-flying units based at RAF Shawbury. It was announced by the Ministry of Defence (MOD) in November 2016 that MOD staff currently based at 1300 Parkway in Bristol would be relocated to Shawbury by 2020. The School of Aerospace Battle Management, part of the Defence College of Airspace Control, is expected to move to Shawbury from RAF Boulmer in Northumberland by August 2019. ^ "Defence Estates Development Plan 2009 – Annex A". GOV.UK. Ministry of Defence. 3 July 2009. p. 20. Retrieved 6 April 2019. ^ "UK MIL AIP - SHAWBURY - AD 2 - EGOS - 1 - 1" (PDF). UK MIL AIP. 28 March 2019. Retrieved 6 April 2019. ^ Leach, Kim, ed. (January 2017). "100 years since the formation of the first flying squadron". Aries. Shropshire: RAF Shawbury (1): 6–7. OCLC 921875505. ^ "RAF Stations, West Midlands". ^ Lake 1999, p. 108. ^ a b Delve 2007, p. 269. ^ Francis 2010, p. 27. ^ Lake 1999, pp. 46-47. ^ Delve 2007, p. 271. ^ Lake 1999, p. 104. ^ Lake, Alan (1999). Flying units of the RAF : the ancestry, formation and disbandment of all flying units from 1912. Shrewsbury: Airlife. p. 104. ISBN 978-1-84037-086-7. ^ "Assault Glider Trust Timeline". Assault Glider Trust. 20 January 2017. Retrieved 23 November 2017. ^ "Jubilee Sports Hall opened at RAF Shawbury". Ministry of Defence. 7 June 2012. Retrieved 3 July 2012. ^ "A New School for RAF Shawbury". RAF Shawbury. 7 April 2016. Archived from the original on 13 April 2016. Retrieved 23 November 2017. ^ "UKMFTS Rotary Wing Aircraft Service Provision Contract Awarded". Aerossurance. 23 May 2016. Retrieved 18 January 2017. ^ "£9.5 million contact awarded over new RAF Shawbury training centre". Shropshire Star. 26 August 2016. Retrieved 6 April 2019. ^ "Training centre work at RAF Shawbury to end next year". Shropshire Star. 19 April 2017. Retrieved 6 April 2019. ^ "Military Aircraft Markings Update Number 157, June 2018" (PDF). The 'Military Aircraft Markings' Web Site. June 2018. p. 3. Retrieved 22 July 2018. ^ "Airbus H135 Juno". Royal Air Force. Retrieved 22 July 2018. ^ "Military Aircraft Markings Update Number 155, April 2018 Part 1" (PDF). The 'Military Aircraft Markings' Web Site. April 2018. p. 6. Retrieved 22 July 2018. ^ a b Dufton, Lieutenant Colonel Jon (2018). "Foreword". Aries. 3: 4–5. ^ "RAF Shawbury". RAF Shawbury. Retrieved 23 November 2017. ^ "What We Do". Ascent Flight Training. Retrieved 28 July 2018. ^ "UKMFTS Rotary Wing Aircraft Service Provision Contract Awarded - Aerossurance". Aerossurance. 23 May 2016. Retrieved 28 July 2018. ^ "705 Naval Air Squadron". Royal Navy. Retrieved 28 July 2018. ^ "CFSH". RAF Shawbury. Retrieved 23 November 2017. ^ "Contractors". RAF Shawbury. Retrieved 23 November 2017. ^ "About Us". RAF Shawbury. Retrieved 2 August 2017. 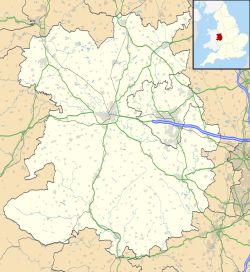 ^ "RAF Shawbury airbase to be extended as units move in from Bristol". Shropshire Star. 9 November 2016. Retrieved 23 November 2017. ^ Mullen, Group Captain Chris (2019). "Foreword". Aries - The Magazine of RAF Shawbury. Forces & Corporate Publishing. 1: 5. Delve, Ken (2007). The military airfields of Britain; Wales and West Midlands. Crowood Press. ISBN 978-1-861269-17-1. Francis, P. 20th Century Military Archaeology Issue 1: Airfield Defence. ARP & AiX-ARG Archive Limited. ISBN 978-0-9521847-0-6. Lake, Alan (1999). Flying units of the RAF; the ancestry, formation and disbandment of all flying units from 1912. Airlife. ISBN 978-1-84037-086-7. Smith, David. J. (1981). Action Stations, 3 :Military Airfields of Wales and the North-West. Patrick Stephens Limited. ISBN 978-0-85059-485-0. Wikimedia Commons has media related to RAF Shawbury. Airport information for EGOS at World Aero Data. Data current as of October 2006.